Thanks to our caring donors and friends, we are pleased to announce the following newly established UFV leadership awards, scholarships and bursaries – totaling over $137,250 which will mean an additional $8,500 for awards annually for UFV students! Awards make a big difference in the lives of UFV students. 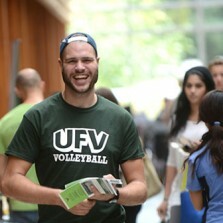 Currently, UFV administers more than 300 awards annually. Established in loving memory of her two children, UFV Honorary Doctor recipient Ginny Dennehy wants to help students at UFV through this endowed award. According to their mom Ginny, they were not the best students but they were good students. They were not the best athletes but they were good athletes but most importantly they were two children who had warm, kind, gentle hearts who wanted to give back and make a difference so they could help others. It is the family’s wish to have the recipient understand and make a difference for those who suffer from mental illness. This award was established in tribute to Richard Best who worked for Davis LLP within the IT Department. Davis LLP wanted to create this legacy for Richard, a UFV alumni (attended UFV in the 70’s when it was called Fraser Valley College. Established for a UFV student enrolled within any Computer Information System program stream and who has demonstrated collaboration and in-class participation. The Canadian Federal government provides additional funding for French studies and these funds can be used at the discretion of the MOLA department at UFV. The department established and funded an annual award until 2013 when it was converted to an endowed scholarship. The goal of the award is to encourage students to continue learning French at UFV. This award is available to a 3rd or 4th year UFV student studying French. Preference will be given to students with a declared major or extended minor in French. Walter Sussel established this award in memory of his father. Sam Sussel immigrated to Canada in 1936 with his wife and children, a fugitive from the Nazi regime in Germany where he could no longer continue to practice as a lawyer. Settling in Chilliwack, in 1940 Sam started to farm. Due to his legal and business background, soon became a highly respected resource to the agricultural community in business matters. In 1949, he gave up farming to become a full-time accounting a agri-business consultant. This scholarship is to be awarded to an Agriculture diploma student with the highest aggregate grade point average in the following courses: Enterprise Project, Part 1, Introduction to Agri-Economics, Essentials of Marketing and Professional Selling. The Marcellus family has a heartfelt desire to support an English program student who is facing financial need as a way of celebrating their mother and grandmother’s passion and community involvement in writing activities. In addition, Dr. Catherine Marcellus was a respected UFV Honorary Doctorate. Available to a UFV student currently enrolled in the B.A. degree program, this award is open to full-time students entering into 2nd, 3rd and 4th year of study. Students must demonstrate an interest in writing, English or literature and have completed a minimum of 4 courses in one of these areas. As a way of celebrating Dr. Jim Marcellus and his career in medicine, the Marcellus family has a heartfelt desire to support a nursing program student who is facing financial need. Available to a UFV student currently enrolled in the Bachelor of Science in Nursing (BSN) program, the award is open to full-time students entering into 2nd, 3rd and 4th year of study. Students may be in the Registered Nurse program. At age 14, Rachel Barsky succumbed to severe childhood asthma.An avid reader, her interests were beginning to turn to hair ribbons, nail polish and boys. Nonetheless, her focus, disciplined study habits and intelligence ensured her academic success, despite missing many days of school due to illness. With a penchant for languages and aspirations to become an interpreter, Rachel doubles would have been a university scholar. The Barsky family establish this bursary to provide a student in Upgrading and University Preparation, Faculty of Applied and Technical Studies, Faculty of Health Sciences, Faculty of Professional Studies or Faculty of Science with this award. Preference given to a student who is the first in their family to attend university. Dr. and Mrs. Sussel’s intent in establishing this bursary is to support mature individuals in financial need who have chosen to go back to school to pursue further education. Both Walter and Beryl Sussel pursued higher education as mature students and experienced the attendant challenges. They understand the mature student’s needs to raise a family, study and be employed at the same time. The student must be a Chilliwack resident or have attended a Chilliwack High School. Recipient must maintain a 2.5GPA and be enrolled in a minimum 60% course load/9 credits. Are you interested in discussing establishing a UFV award? Contact Sheila Reimer or Sherri Magson for more information.